Diabetic eye disease blinds more people of working age than any other condition. November marks Diabetes and Diabetic Eye Disease month to raise awareness of the serious consequences of diabetic retinopathy. “Unfortunately, diabetic retinopathy is the leading cause of blindness in people under 65 and is completely preventable,” notes Dr. Warminski, adding “the more people are aware of the consequences of their disease, the more proactive they can be.” Diabetes and elevated blood glucose levels cause blood vessel damage throughout the body. The damage is most severe to small blood vessels, especially in the eye, kidney, fingers and toes, heart, and brain. As long as the blood glucose is elevated, there is microscopic damage to the cells that line the walls of small blood vessels and microaneurysms form. 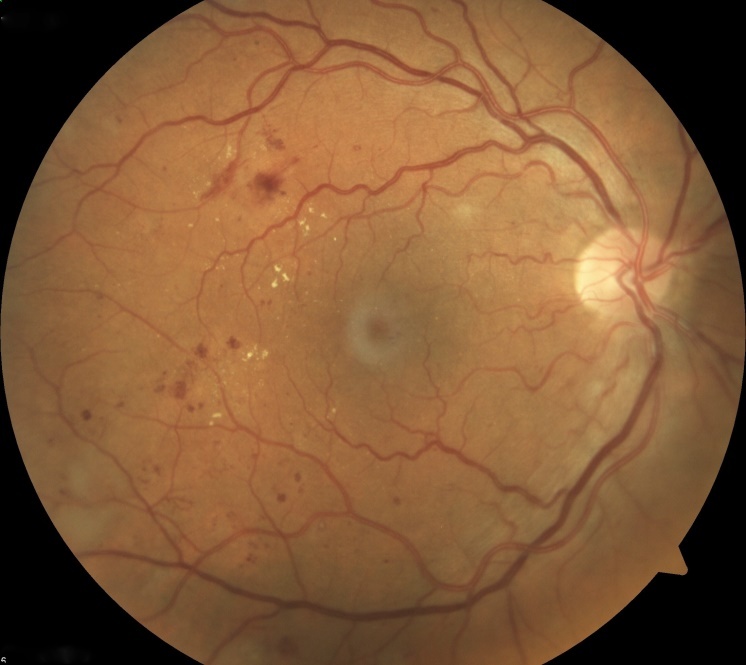 These are focal areas of weakness in blood vessels that can bleed or leak fluid and lipid into the retina as the earliest signs of diabetic retinopathy. The beginning stages are known as Non-Proliferative Diabetic Retinopathy (NPDR) and is graded based on severity; mild, moderate, and severe. As the damage progresses, the vessels in the periphery of the retina become unable to carry blood to supply the nutritional needs of the retina and eventually the retina responds with the development of new blood vessels, a process known as neovascularization. When new blood vessels form the damage is termed Proliferative Diabetic Retinopathy. During the progression of disease, the diabetic retinopathy can be complicated by the development of Diabetic Macular Edema (DME). In these cases, the central retina, known as the macula, begins to swell from fluid accumulating causing the retina’s function to worsen and can begin to cause decreased vision. DME is the most common cause of vision loss in patient with diabetes. Dr. Sai Chavala describes that, “diabetes damage accumulates over a lifetime and is not the result of one short period of elevated blood glucose. As a result, most people will develop some diabetic retinopathy in their lifetime.” He adds, “it is recommended for patients with diabetes to have yearly, dilated exams to evaluate for signs of diabetic retinopathy.” To prevent developing retinal damage, maintaining blood glucose levels consistently below 120mg/dL and a Hemoglobin A1C less than 6.5% will greatly reduce the risk of developing advanced diabetic retinopathy as well as help stabilize any damage that might be present. Control of hypertension is also important, as elevated blood pressure can worsen diabetic retinopathy as well as cause damage itself. RCT physicians are skilled in the diagnosis of diabetic retinopathy and treatment of its complications. Working with partners in the community, they remain available should the need arise. Please visit the main website for additional description about diabetic retinopathy as well as the treatment options.